greatly simplifies startup of the application. Images are available on Docker Hub repository. That's the easiest and fastest way of launching the gateway. You can run it on your machine (or in a cloud!) and you don't need to checkout the code, compile, configure, etc.. anymore. Of course if you still prefer to do it the "classic" way (i.e. checkout sources, build & run the app…) follow this tutorial. ogn-gateway-stats 1.0.0 This plugin is responsible for the analysis, computing and storing of selected information extracted from aircraft and receiver beacons in a SQLite database. These information include: number of aircraft beacons received by each individual OGN station (daily), max. range captured by each of the receivers (daily), max. altitudes captured by each of the receivers (daily), etc..
Once build, your new plugin jar simply needs to be put into ogn-gateway's configured plugin folder. It will be automatically discovered and initialized. No need to restart the gateway. Once started, the OGN gateway will be producing a number of logs. I shortly describe the default set below. Please note that the number of logs and their thresholds can easily be reconfigured (also at runtime) by manipulating the log4j.xml configuration file which can be found in the conf subfolder. This logger logs ALL the packets which are in theory supposed to be relayed to the ogn gateway plugins. In theory - because if a gateway works in simulation mode an entry will still be logged yet a beacon is in fact not relayed. This logger uses daily-rolling appender - i.e. one file per day is created. All stdout/err not caught by any other loggers would end up in this file. Useful to look into for debugging in case of problems. Logs an entry each time ogn-gateway process is started or stopped. No need to describe I hope. It uses a daily-rolling appender. If an OGN aprs packet contains fields which have unexpected format such packets will be logged into this log. This logger uses daily-rolling appender. OGN logs IGC files using IGC logger. Note: The default location of IGC files can be changed by overwriting a ogn.gateway.igc.folder property ( in the gateway.properties file, setting corresponding JVM env. variable: -Dogn.gateway.igc.folder=…) or by setting OGN_GATEWAY_IGC_FOLDER environment variable. JMX is very handy to introspect a running java process. JMX beans expose a variety of metrics which can be monitored at run-time and help to detect problems (e.g. memory leaks, growing number of threads, deadlocks etc..). There is a set of beans exposed by default by every java process but in addition ogn-gateway-java exports a set of its own "specific" beans. There is a set of configuration parameters which can be set in order to tune OGN gateway. These parameters can be specified in the ogn.properties, passed to the java process directly as JVM env variables (-Dvariabe=value) or set through system environment variables. In either case the result is the same. Unless overwritten, the gateway will use default values for all its parameters. To see the parameters names as well as their default values, please refer to the gateway's Configuration class definition (parameter names and their default values can be seen annotated with @Value). 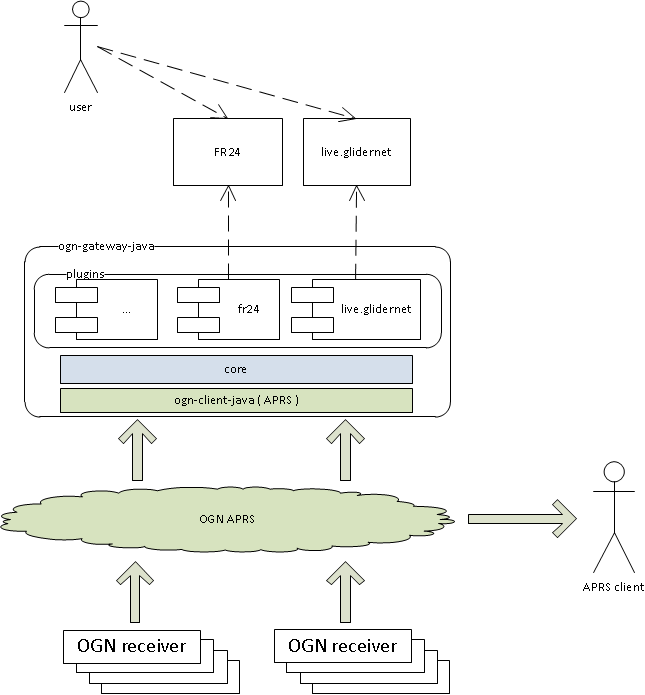 OGN gateway with ASTERIX plugin is a good choice for feeding ATC radar consoles with OGN tracks.